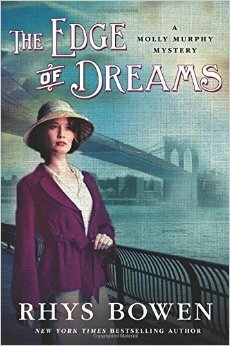 Rhys Bowen’s latest book in her Molly Murphy mystery series, The Edge of Dreams, has a serial mur derer on the loose in New York City. The murderer is taunting the police with letters directed to Molly’s police captain husband, Daniel Sullivan. Much to Daniel’s chagrin Molly is brimming with ideas and champing at the bit to get involved. But Molly is too bright and persistent and has more ideas than he or any of his peers to be still for long. She slowly involves herself in the investigation exposing herself to dangers she’s only seen on the edge of dreams. Although each book can stand alone as complete, it’s always nice to know a person’s history. In case you want to read the entire series as well, below is a list in order of publication.